#MH370 Missing En Route – footsteps……..
Today abuzz on social media, traditional electronic media and talk of the town is the news that Flight MH370 bound for Beijing China was missing along the route. The last tracked position was off the coast of Vietnam. The plane has 227 passengers and 12 crews. For the manifest of the passenger list CLICK HERE. There had been confusing news and postings on the social media especially Facebook flooded with unconfirmed latest status of the plight of the ill-fated Malaysian Airlines Boeing 777-200. MH370 departed KLIA at 12.35 a.m and was scheduled to land in Beijing at 6.35 a.m. However communication was lost while the plane was crossing the South China Sea towards Vietnam. 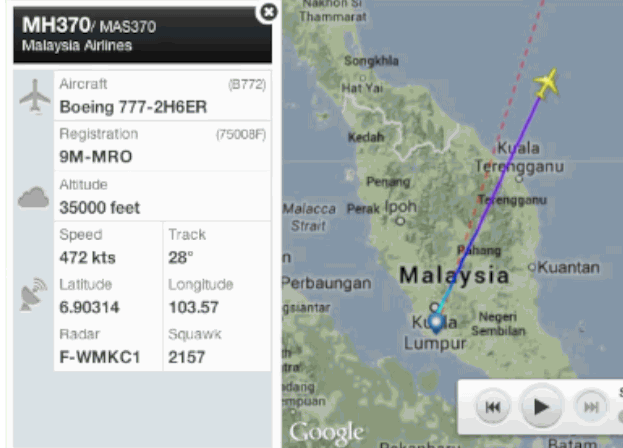 The jet was being monitored by flight tracking website flightradar24.com which shows the plane’s progress before it vanished. The last position recorded was at 1.30 a.m Saturday morning. It has been reported that one of the passenger board the flight with a stolen passport belonging to one, Luigi Maraldi, 37, from Cesena. Read more interesting development HERE. Watch the graphic showing the moment MH370 went missing over The South Chine Sea HERE. When all effort had been deployed for Search and Rescue (SAR) and as member of the public who has very limited knowledge about the aviation industry, let us not make misleading comments. Let the specialist do their work and the priority now is WHERE IS MH370?